How she could possibly stand being up so high on this wall every day—sitting, standing, dancing—with the breeze threatening to pluck her off by her copper-coloured braids like an autumn leaf, he didn’t know. But perhaps it was her fearlessness that Juan found so compelling. 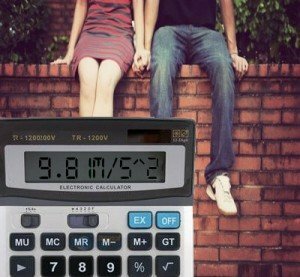 Or perhaps it was because she always carried a calculator in her back pocket—he always did, too—and a girl who considered a calculator a necessity was at least worth the risk of him toppling off a wall and falling 6.25 feet to his death. Camille stood up, easily balancing on the narrow ridge of the wall. Juan wondered if she was immune to gravity, and if that was why she wasn’t ever afraid that it would turn against her. Camille swayed dangerously, lifting up one leg and then the other, teetering in a circle. “No way.” Juan tried to pull his hand away. “You can’t defy gravity,” Juan blurted, though at this point he was only trying to convince himself. He must have sounded panicky because Camille laughed as if he had just asked if you could divide zero by zero and reached for her backpack, which she had hung on the tree. She pulled out two white and red checkered bundles—picnic blankets. Juan nodded and squeezed his eyes shut, imagining himself and Camille, two infinitesimally small beings tethered to the earth by gravity as it fell through space. He could feel the earth turning beneath them as it rushed past the stars hidden by the daytime sky. Then he opened his eyes and jumped, letting gravity take over, both flying and falling at the same time, at 9.81 m/s squared. Six feet didn’t seem so high when compared to falling through outer space. Valerie is a student from Arizona who is an aspiring writer in teen fiction. She often struggles with coming up with ideas but they always do come—often too close to deadlines. This was a really sweet story! I also suffer from writer’s block until right before the deadline so I understand what you’re going through. Keep going! I can’t wait to read more from you! Aww, thank you so much! I’m glad you enjoyed it. That means a lot to me!